These maps tell a different story. 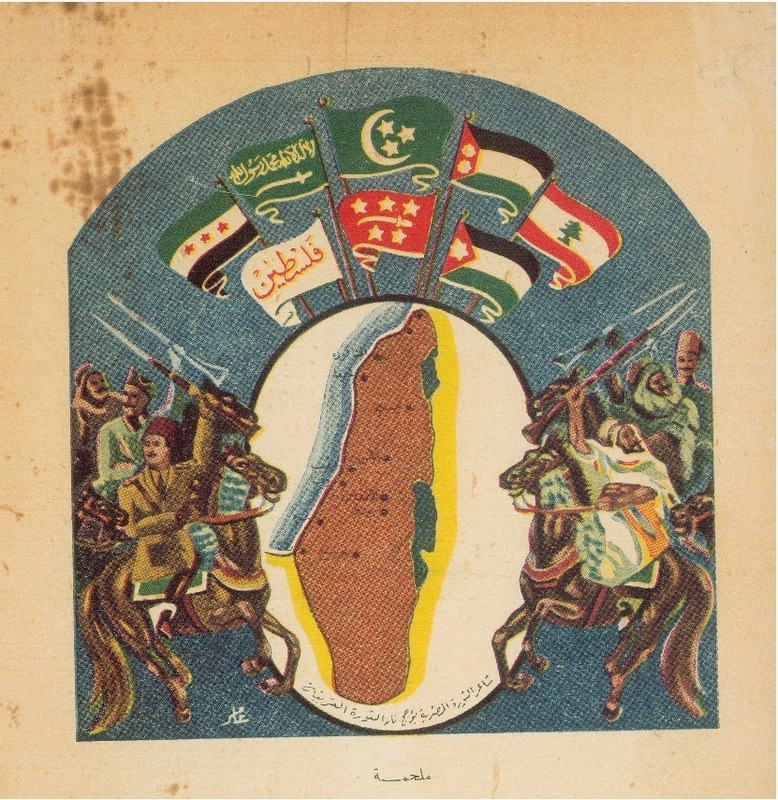 Mahmud Muhammad Sadiq printed this first map on the front cover of his 1948 Liberating the Homeland, with Blood (bi-al-Dima’ Taharrur al-Awtan), before the guns had even fallen silent in Palestine. Sadiq, born and raised in Cairo, received a traditional Islamic education and reportedly memorized the Qur’an at an early age. He was also an accomplished poet and involved in the Egyptian Caliphate Committees in the 1920s which sought to determine who was fit to succeed Abdülmecid II as Caliph, after the Turkish National Assembly abolished the position in 1923. His interest in the broader Arab and Muslim worlds may help explain why he published this tract on the liberation of Palestine, even though he was Egyptian, and why the front cover of his book depicts the entire Arab world acting in unison and harmony to liberate Palestine, even though that doesn't quite reflect how things happened on the ground. (1) Syrian Republic (1932-1958). It was first a puppet state of the French Mandatory government and obtained independence in 1946. In 1958, president Shukri al-Quwatli merged Syria with Egypt, creating the United Arab Republic. (2) Kingdom of Saudi Arabia (1938-1973) This is the green flag with a sword. In case you have bad eyesight, it reads: there is no god but Allah, and Muhammad is his prophet. (3) Monarch of Egypt (1922-1952). This is the Green flag with the moon and three stars. The government was nominally independent, ruled by the British puppet King Farouk's (hated) government, overthrown in the 1952 Free Officers Revolution or Coup that brought Gamal Abdel Nasser to power, the charismatic if autocratic Egyptian President and Arab nationalist leader who ruled his country until his death in 1970. (4) The Monarchy of Iraq (1924-1958). This is the flag with two stars in the red. Hashemite rule in Iraq, along with this flag, came to a bloody end in a coup d'état, led by army officer Abd al-Karim Qasim. (5) Lebanon. This is the red and white flag with a green cedar tree in the middle. Despite many years of civil war and internal strife, the country has managed to hang on to the same flag today! (6) The Kingdom of Yemen (1918-1962), This is the red flag with five stars and a sword. It was founded in the wake of World War I by the Zeidi religious leader, Immam Yahya Muhammad, and ruled in the north of the country until 1962, when Zeidi rule was overthrown by the Egyptian-backed Abdullah al-Sallal, the first President of the Yemen Arab Republic. 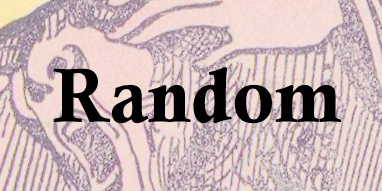 Many thanks to wikipedia's anonymous contributors for helping us identify these flags! What were all these flags doing on a 1948 map of Palestine? After the British withdrew from Palestine in May 1948, Egypt, Lebanon, Jordan, Syria and Iraq sent troops to Palestine. But Muslims also flocked to Palestine from Yemen, Saudi Arabia and Bosnia (apparently unknown to Mahmud Sadiq, who forgot to include a Yugoslav flag). This was one of the first global religious wars of the modern period. Not only did Muslims come from far and wide to fight the Jews, but Jews came from as far away as South Africa and the United States to fight the Arabs. 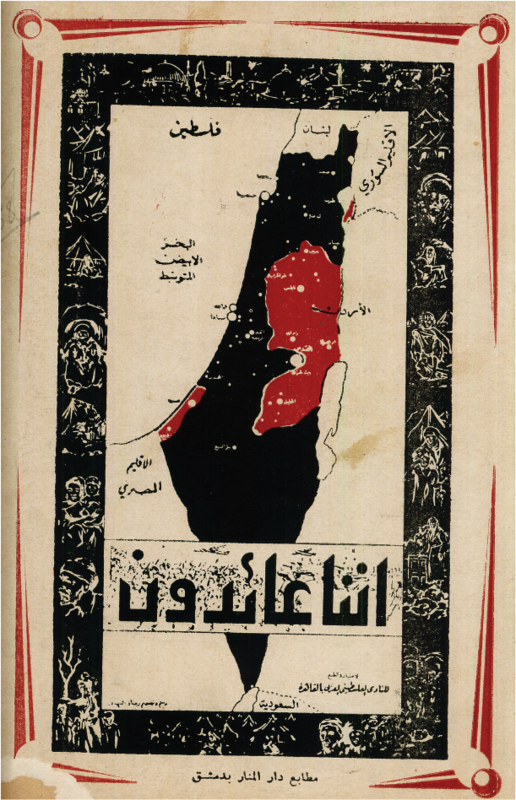 This second map, title “Occupied Palestine,” appeared on the back cover of the 1952 anonymous book titled, Occupied Palestine (Filastin al-Muhtalla). The cartographer depicted the State of Israel as an octopus, extending its arms to all four corners of Palestine. The West Bank and Gaza are shaded white. 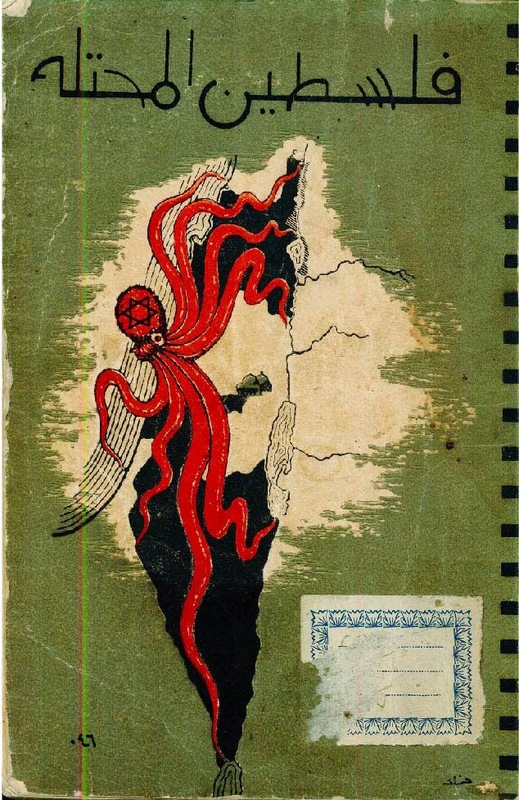 The third map, titled "We Are Returning" (Innana 'Ai'dun), appeared on the back cover of Muhammad ‘Izzat Darwazah's 1959 The Tragedy of Palestine: A Brief Summary of the Palestine Issue, its History, Development, Present and Future (Ma’sat Filastin- Ard Mujaz li-Qadiyyat Filastin wa-Tarikhuha wa-Tatawwaruha wa Hadir Filastin wa-Mustaqbaluha), published in Damascus. Izzat Darwaza was one of the more active politicians during the Mandate period, and interested readers should turn to his anonymous biographers over at Wikipedia to learn about him and his life works. Suffice it to say that this work was one among many dozens of polemical histories written about the conflict beginning in the mid-late 1930s, covering the history of the conflict from the aftermath of the First World War, and explaining the righteousness of the Arab case for Palestine, and the moral bankruptcy of the Jewish case. Although Darwaza was little interested in Islam, which plays almost no role whatsoever in the narrative of the conflict, he does quote the Qur'an at the very end of his book, predicting that the Jews will eventually get what they deserve, and the Palestinians will return to their land. He quoted the following verse to end his book: "It is he who expelled the ones who disbelieved among the People of the Scripture from their homes at the first gathering. You did not think they would leave, and they thought that their fortresses would protect them from Allah ; but [the decree of] Allah came upon them from where they had not expected, and He cast terror into their hearts [so] they destroyed their houses by their [own] hands and the hands of the believers. So take warning, O people of vision" (Qur'an, 59:2).